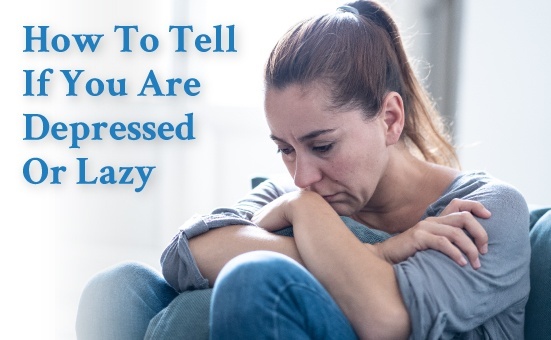 Have you looked at your spouse, friend, or family member and questioned whether they are depressed or just lazy? While the two share a few similarities, it is important to understand how different they are. As a psychological counselor, I have spent many years helping clients cope with their feelings, manage their stress and recover from depression. I understand your struggles and work hard to improve your emotional well-being. Keep reading to learn how depression can be misunderstood, often creating more pain. Laziness should not be mistaken for depression. Lazy individuals laze around the house all day but they find a reward in avoiding tasks. They say they will do more to help but fail to follow through. They may criticize everyone, except themselves. Depression creates a lack of motivation, but it is a self-defeating lack of motivation. As the depressed individual performs fewer and fewer activities their life becomes less rewarding. A severely depressed individual will struggle to even take a shower or other basic activities of daily living. What we refer to as a lazy individual is someone motivated to avoid certain unpleasant tasks (such as mowing the lawn). The avoidance of the task is a reward because the task is unpleasant; the reward becomes the avoidance of the unpleasant task. However, not all activities are avoided. The lazy individual can enjoy many activities and appears joyful while carrying out these pleasant activities. For those struggling with depression, the past, and the future hold little hope for pleasure. When the depressed individual looks at him or herself, they only see the failures of the past and anticipate failure in the future. More importantly, they see themselves as the reason for the failure. When their success is highlighted, a person with depression will attribute this to luck but takes full responsibility for his or her failure. The lazy person’s negativity focuses on the shortcomings of their environment. “If only things were different, then my life would be better.” Being a victim of the environment, the lazy individual takes no personal responsibility for the outcome of their lives. Someone who is depressed focuses on their own shortcomings and withdraws from others. They feel unworthy of others caring for them and withdraw from friends and family. Activities that once were enjoyable are avoided by the tendency to isolate. The lazy individual is interested in manipulating others’ impression. He or she wants others’ concern as he or she offers excuses for underachievement. Others’ concern then allows the lazy individual to maintain self-worth without performing the undesirable behavior. Depressed individuals can feel ashamed of their lack of productivity and even feel worthless. It is essential to let them know that you care about them because they are important to you. Depression can last for six months or a lifetime. Regardless, it can be treated and should not be ignored. If you or your family member appears depressed, encourage them to talk to you about their views (probably negative) and feelings (pain). You can then gently nudge them to seek professional help. For a counseling psychologist in Memphis, TN, reach out to Dr. Lee Horton, Ph.D. I received my Master’s degree from Auburn in Marriage and Family Therapy and my Doctorate from the University of Southern Mississippi in Counseling Psychology. In my twenty-five plus year career, I have helped numerous individuals, couples and families overcome obstacles and lead them towards a more fulfilling life. To schedule an appointment with me, please click here. To learn more about how I can help you, please click here or get in touch with me by clicking here.